Nathan, can you send me the link to those pre-wrap alternates? I’ve noticed a lot of people starting to use js includes and other stuff for polls, comments, ratings, etc. For us, I think it’s a matter of integration. Is it something we care to tightly integrate into our system to do custom queries and views things like that or is it something we just want to throw in? For polls, not sure which way is better. What do you think? The new and improved Channel 9 has shipped! We built a whole new code base for a video blog site and launched a new site (Channel 10) on that code, bringing some of the video style of Channel 9 to a new audience. We often discussed, as we shipped out revision after revision of the Channel 10 home page, that our next goal would be to ship out a new version of Channel 9… all moved onto that new code. Things didn’t go according to plan though, and we shipped out VisitMix.com, Channel 8, and TechNet Edge (for IT Pros) before we were really given more than a moment’s peace to start planning out the work to deploy Channel 9 on a new code base. When it did become time to plan the channel 9 deployment, it turned out that, while the new code base was a major improvement in many ways, the feature gap between what was already available on 9 and what the new code could offer was substantial. Now at least a year and a half had gone by since I joined the Channel 9 dev team, and we could see a long road ahead of us to get the next version of Channel 9 shipped; all the while, new features, bug fixes and UI changes for the other channels kept coming up and mixed priorities from above meant that we still had to devote most of our time to those properties. Finally, at the start of this year (2008), I was asked to start laying out a firm plan that would get Channel 9 v4 (as we took to calling it) shipped. As part of that, we gained a new focus on channel 9 and were able to finally prioritize it above some of the day to day needs of our other properties. We weren’t completely focused on the task, but we finally had the ability to say no to most things that would pull us away from C9… progress began to be made. 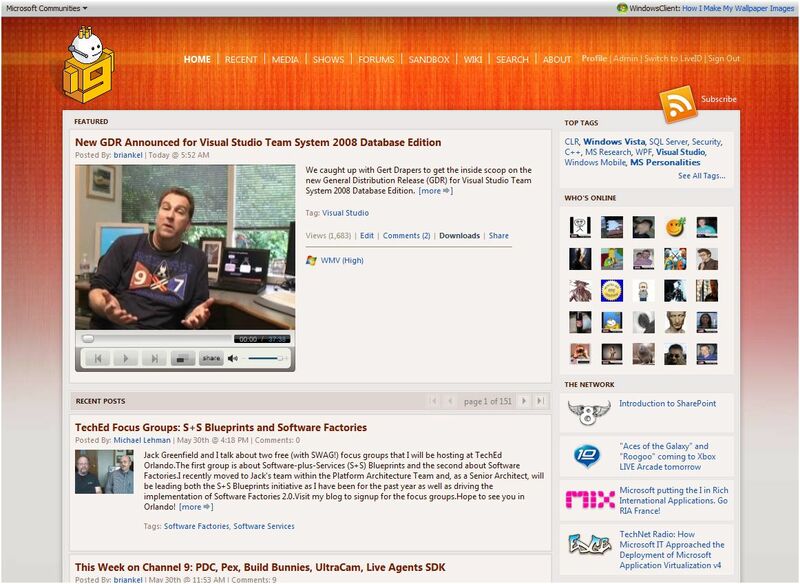 At the start of May of this year we shipped out a beta version of Channel 9, and by the end of the month (June 2nd to be precise) we did the final switch over, made the DNS change that pointed channel9.msdn.com at a new set of web servers, and v4 was officially launched. Over the next week or so, we were bogged down dealing with a wide variety of bugs that didn’t turn up during our own testing or in the beta, but the site stabilized and is now running fairly well. We still have bugs, but the old site had bugs that had sat for months, so I think we are in pretty good shape. You can see a picture gallery of the various Channel 9 home pages that were envisioned or deployed throughout the past few years, including the new one… and a similar gallery representing the many home pages of Channel 10 that we shipped over the course of just a few months. all in all, I’m very happy with the site we shipped last week and very impressed with the team behind it all… it has been a busy couple of years, but it is nice to have tangible (if you can consider the web tangible) results that you can point at when you are thinking about what you’ve accomplished. 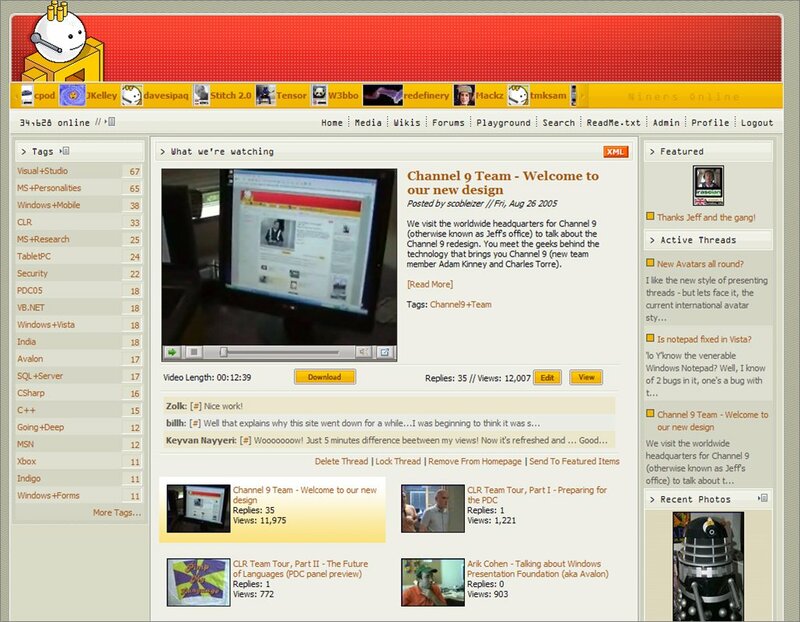 Author Duncan MackenziePosted on June 11, 2008 January 30, 2013 Categories Channel 92 Comments on The new and improved Channel 9 has shipped! We recently had Donovan West (LiveGadgets.net) build us a set of sidebar gadgets for Windows Vista. These gadgets use the RSS feeds from each site and let you see all of our new content as it gets posted, then (using Silverlight) you can even play our videos right there on your desktop.